Shadow Dancer is a story of how the political becomes personal. A woman, Collette McVeigh, whose family is deeply involved in the IRA in 1990's Belfast, is captured after a bomb plot in London goes terribly wrong. While in custody, she's given a heartbreaking choice: spy on your family's IRA activities for British Intelligence, MI5, or go to prison for the next 25 years. Collette is not as sympathetic a character as one might expect a protagonist to be. It is more difficult to portray organizations who use violence such as sympathetic, as they have been in the past. However, the movie is thoughtfully directed by James Marsh, and the actors, including Clive Owen, Gillian Andersen, and Andrea Riseborough as Collette. Politics eventually takes a back seat though as the scope narrows on how Collette's choices - past and present - affect her family. Even just making the choice in the first place is difficult. She's being asked not only to betray an organization she believes in, but one that her family is active in. However, it's that activity that causes the first crack in Collette's devotion to the cause. Her young brother, lost in the violence of the Troubles, prompted his brothers to become even more hard-line, but a young Collette's feelings grew ambivalent. Perhaps that made it easier for her handler, Mac, to turn her. There are complex layers among this spy movie - which does have its share of typical tropes - there are chase scenes, some assassinations, and a nice visual touch of Collette wearing a red trench coat in the muted tones of the rest of the movie. In addition, the movie is not overburdened with too much dialog; but just enough to get the complex story across. There's a dichotomy of intimacy and suspicion within Collette's family, and although Mac wants to protect his informant, he doesn't necessarily have the full support of his superiors; conflicts within factions and between people give this story a weight and gravitas that make this a film worth seeing. 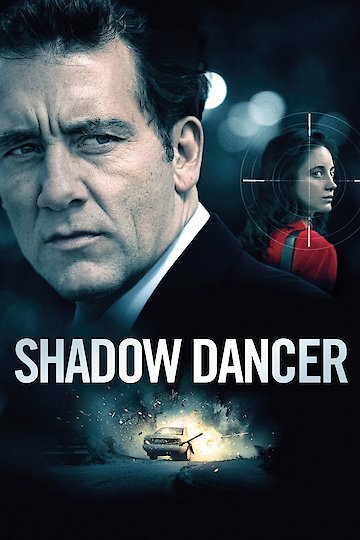 Shadow Dancer is currently available to watch free on Tubi TV and stream, download, buy on demand at Tribeca Shortlist, Warriors and Gangsters, FlixFling VOD, Amazon, Vudu, Google Play, iTunes, YouTube VOD online.